Collated nails and collated staples marketed under the GRIP-RITE® brand are guaranteed to properly load, feed, and actuate in all brands of tools designed to operate with that specific fastener type. If you are the original purchaser and not 100% satisfied with the jam free performance of your GRIP-RITE® collated fasteners, please return to the retailer where the fasteners were purchased and ask for a refund or replacement. 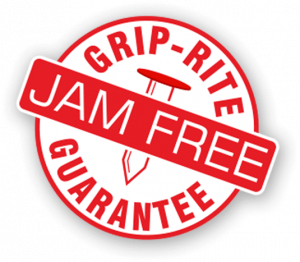 If the retailer’s return/refund/replacement policy window has expired, the GRIP-RITE Jam Free Guarantee extends our commitment of consistent jam free performance for a full 6 months from the date of purchase. If you are the original purchaser and your GRIP-RITE collated fasteners fail to load, feed, or actuate properly in any brand tool designed for the specific type, size, angle, and gauge fastener purchased, you may submit a claim directly to PrimeSource Building Products for replacement product. Click here to download a copy of the official Jam-Free Guarantee Claim Form and instructions. For questions or claim updates, please call 1-866-453-5815.